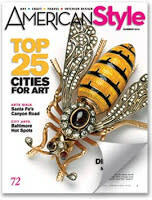 Athens is known for being a great destination for all things art and music, and in its annual survey, AmericanStyle magazine has again ranked Athens among the nation&apos;s top 25 arts destinaition. This is the ninth straight year Athens has been recognized for its arts community, and we ranked eighteenth among mid-sized cities! Go Athens! Athens&apos; arts offerings will expand in the coming months with the reopening of the Georgia Museum of Art in early 2011, which will add a larger scope to the already thriving local arts scene. Athens is home to numerous local galleries and museums, including the Lyndon House Arts Center and ATHICA: Athens Institute for Contemporary Art. Athens&apos; downtown retail shops also feature a diverse range of local artwork, such a R. Wood pottery found at Toula&apos;s downtown. Athens is definitely worth the trip if you are interested in the arts. It&apos;s a destination with thriving arts &amp; cultural scenes, and if you haven&apos;t been, you need to come visit! Below you can find a list of some of our favorite Athens arts locales, and a complete list of of Athens art destinations can be found here! Enjoy! Aurum Jewelry, Art, &amp; Gallery- amazing jewelry by award-winning local artists, plus regional art! Healing Arts Center- art for the mind, body, and soul! Lamar Dodd School of Art Galleries- revolving shows of student, faculty, and professional art! Lyndon House Arts Center- large airy galleries, a children&apos;s wing, artists&apos; workshop, and gift shop! Mercury Art Works at Hotel Indigo- showcases local and national multimedia artists! R. Wood&apos;s Ceramic Studio &amp; Shop- nationally acclaimed, one-of-a-kind, handmade pottery! Railroad Arts District- collective of artists and businesses centered around the railroad tracks! Visionary Growth Gallery- features local and national artists as well as disabled professional artists!